You might not know, but the Laughlin River Run in Laughlin, Nevada is also the location of the first giant coal-fired power plant (Mohave Generating Station) to shutdown. Our morning departure out of Portland found rain coming down in sheets and the wind blew like a hurricane. At one point it cost $24 to fill up a five-gallon Harley. 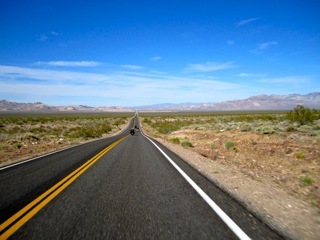 My first motorcycle ride through Death Valley. The ‘River Run’ had all the built up energy for a spring rally, but the vendor “cha-ching” wasn’t quite as loud as in some years. Walked into the Aquarius Casino Resort and had no problem getting rooms without reservations. Lucky? Room rates were 5X the typical standard pricing ($39.95 vs. $199.95/night). Anyone who has made it through Econ 101 knows that the scarcity of a commodity drives its value, but this clearly qualifies as gouging (yet we paid it?!). The large presence of the Mongols MC members at the Aquarius made for some interesting moments entering/exiting the hotel. The Aquarius temporarily restricted access to the casino floor Saturday night at the height of the River Run, however, they deny rumors that the restriction had anything to do with the presence of “outlaw” motorcycle clubs. There was a large, well armed and highly visible Las Vegas Metropolitan Police presence at the River Run. No major problems were reported. On Friday, April 29 we witnessed a 45mph+ sustained wind storm. Number of show-class motorcycles damaged by flying debris. H-D was absent from one of the largest west coast rallies and relinquished customer goodwill to Polaris and Yamaha. Why? We’ve had so much nasty weather in Oregon during April that I’m confident about anything May throws at us will be better. Photo taken on trip in Death Valley.